The geology of the area is such that the majority of reefs run east to west, have a sheer north face and a top that slopes southwards to disappear into the sand – something like a saw-tooth in cross section. When approaching Beadnell harbour, take note of the shape of the main headland, it’s a typical profile albeit larger than most. Usually the highest reef in a group is to the north and several smaller reefs parallel it to the south. Sometimes the most southerly reef of a group cannot be found depending on how the winter storms have moved the sand around. The north faces are riddled with crevices, some of which penetrate several metres. In previous years these held large populations of edible crustaceans but their numbers seem to have reduced in recent years. There are numerous east-west running reefs scattered from Beadnell all the way up to Seahouses. Some are merely ledges of rock whilst others are quite impressive. Generally, the ones closest to Seahouses are the least dived and as a result can often produce pleasant surprises, cuttlefish, octopus, dogfish and of course large lobsters and crabs are very often the norm. 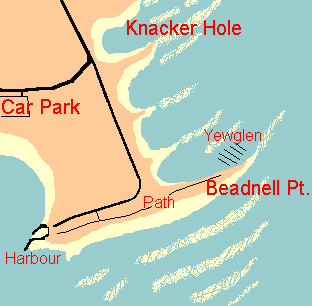 Knacker Hole is one of the small bays at Beadnell – adjacent to the road junction where you continue straight on to the harbour or veer right for the car park. It’s possible to park on the roadside and at high tide the waters’ edge is mere metres away, ideal for night dives or training. Understandably the local residents get a bit fed up with divers stripping off in front of their lounge windows, so please, exercise a little diplomacy and modesty. For day dives or near low-water, it’s best to walk along the rocks on the south side avoiding the weed coated rocks (slippery) and enter into deeper water (stay on the rocks, don’t walk across the garden of the big white house). The walls here aren’t as impressive as those at Beadnell Point but there are more terraces to explore. The further seaward you go the better they become with overhangs and small caves. Not too much kelp, and plenty of flat sandy expanses for ocassional dogfish and flatfish with a maximum depth of 13 metres if you venture far enough. Heading north takes you across a narrow sandy/shale area onto the kelp infested southern slope of another reef. This is quite a wide expanse of kelp and is often subject to heavy swell. Entry/exit off the small beach at low tide used to involve crossing a mixture of smelly silt and mud this is now the easiest option. Currents: Negligible except on surface at seaward end. The north side of the point is reached in the same way as above, however it does involve a much longer walk to the end of the point. Especially at low water! The submerged reef extends at least 150 metres seawards, curving slightly northwards, and in places the vertical face is five metres high. Being in the main current stream means that it’s covered in life – anemones and alcyonium etc. ; it’s a pleasant swim over the full length and to finish off your air the wreckage of the Yewglen. The Yewglen ran aground on Beadnell point in February 1960. Her remains now lie in 8 meters of water is less than twenty metres from the entry point. Among the wreckage which can still be seen are hatches, boiler, plates, girders and bits of machinery.